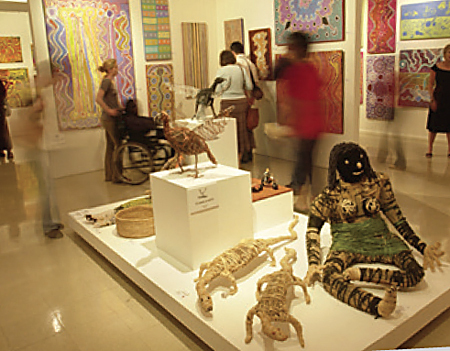 Only the tourism industry stands between Alice Springs remaining a market economy or turning into mainly a welfare town. Tourism is the Territory’s second-biggest employer, behind only the public service. Despite its immense potential, the industry has been in a 10 year slump. In dollars that have not been adjusted for inflation, tourism in the Central Region (Alice Springs and the East and West MacDonnells, not including Uluru) earned $275 million in 2007, had its lowest point in the year ending March 2012 with $227 million and stands at $313 million as at year ending September 2014. It was a decade when “Australia’s regional tourism industry basically fell on its head. In the Territory the industry was seriously decimated by the change of travel patterns,” says Tony Mayell. He and the NT Government’s Tourism NT (TNT), which he heads up, are crucial in the current recovery effort. He does not hesitate to agree that TNT needs to operate in the interest of the people of the Northern Territory. TNT has by far the deepest pockets, measured on a population basis, of any state tourism organisation: Around $40m a year. But then, what else is new: WA is set to get back 35 cents for every GST dollar it pays. The Territory can look forward to $5.50. Mr Mayell spoke with editor ERWIN CHLANDA. Tony Mayell grew up in the Territory, including time in Alice Springs, managed the Ayers Rock Resort from 2006 to 2007 and for 18 months between mid 2011 to late 2012 ran Tourism Tasmania – in that other small state with a keen eye on the tourist dollar. Mr Mayell says in the first two years at the TNT helm much of his effort was focussed on “getting some stability within our structure,” migrating the HQ from Darwin back to Alice, and revisiting the relationship with industry itself and the two major Regional Tourism Associations in Alice and Darwin. The cost for the move to Alice was just short of $1m. So today there are 25 staff in Alice and 40 in Darwin, with a further six based interstate. Now the task can be tackled full bore to “stop us on that downward slide we were on for a long time,” says Mr Mayell. So, what, on behalf of the industry in The Centre, does TNT offer our visitors, what’s on the shelf, what is the “product” we have to sell to tourists from around the country and the world? We were encouraged to got to the web and found links to “Alice Springs & Surrounds – 4WD to Palm Valley, Alice Springs Desert Park, An Aboriginal Art and Culture Tour, Olive Pink Botanic Gardens, Quirky Cafés and Restaurants, Rainbow Valley, The Ghan Rail Journey and the West MacDonnell Ranges. The latter suggests that you can “do” Alice in 24 hours (the sites around town); or in three days (sites around town plus the nearby West Macs) or seven days (town, the inner loop via Hermannsburg, Glen Helen and the string of West Macs landmarks, and Ross River). Alice competes on the website map with similar options for regions called Arnhem Land, Darwin and Surrounds, Kakadu, Katherine and Surrounds, Tennant Creek and Barkly Region and Uluru and Surrounds. We put to Mr Mayell that the current Do the NT campaign is remarkable mostly for its blandness: The same middle-aged couple sipping cocktails by the poolside; gazing into the distance from a location that could be anywhere; riding camels with Uluru a far-away speck on the horizon; enjoying food at an outdoor market – that type of stuff. Mr Mayell explains this is “making people aware of what’s available throughout the whole Territory. “There is a glaring lack of awareness amongst our target market segments that the NT has the basic holiday amenities like swimming pools and quality accommodation, that the creature comforts are there to underpin sensational holiday experiences has to be staring point. “All our advertisements and the imagery and language we use in promoting the NT are driven by research and monitored, and is obviously not made for you and the Territory audience. “When we get them on the hook we follow up with region-specific and destination-specific information,” bearing in mind that the NT is close to the size of Western Europe and embraces environments as different as Borneo’s and Mali’s. That second phase is done through websites, brochures and for example, a pamphlet “How to do the NT” which went out to just over a million households last year, in selected postcodes around the country. Mr Mayell says a survey just to hand shows it’s working: “Tourism NT’s Marketing Tracking Survey, which monitors domestic consumers as they move through what we call the conversion funnel, tells us this: The most recent wave over summer 2014/15 shows a greater proportion of respondents in the planning / phase and fewer in the earlier stage which is being interested and aware. “Following the campaign activity, including the TV advertisement, the NT moved into second place behind Queensland in terms of awareness as a holiday destination. Mr Mayell says most of us locals are in the thrall of the region’s romanticism. We love it. The images and the stories make their way around the country and the world and people may say: “I’ve got to do that some day”. “For someone down south this is a bit intangible,” says Mr Mayell. “They might say that looks beautiful but how do I get there, what’s it going to cost me. Can I stay at a place that has that same view. 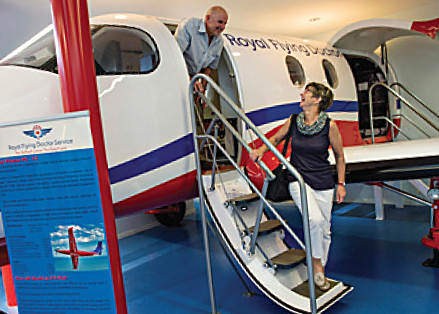 Organisations such as Flight Centre and Wotif are roped into that process. The promotional task isn’t overwhelming: Alice Springs has just 1302 commercial accommodation rooms in establishments with more than 15 rooms, about 400 fewer than 10 years ago, says Mr Mayell. Of course, we can fill these rooms with people spending $50 or $1000 a day. “What’s the sort of punter we’re looking for? The high yielding passenger,” says Mr Mayell. “The sort of people who are going to come to the Territory aren’t really low cost passengers. We don’t want those. That’s why the Tiger Airways model was never really suited here – this is more about low cost carriers requiring significant population bases to fly between and proximity to home base. “I get frustrated, even with people in the industry, asking how can we compete with the Gold Coast. “They do seven nights for $399 and an airfare each way for $100 from Melbourne and Sydney. Do we have product – that awful word – to attract the high yielding passenger? “Of course we do,” he says. NEWS: Looking at the ups and downs over the last 10 years, do the statistical curves of tourism Australia-wide and in the Territory parallel each-other fairly closely? NEWS: So we didn’t do any worse than Australia as a whole? MAYELL: If you are looking at regional Australia, we’ve done OK. Sydney and Melbourne have experienced huge increases in air capacity from international markets. That obviously translates into the bottom line in some way. Most of Australia missed out on all that. NEWS: How should the NT industry be measured – by numbers of people and visitor nights, or the industry’s earnings, NT-wide currently $1.85b a year in terms of visitor expenditure? MAYELL: It’s all about money, the TNT’s return on investment. The board agrees. We want the high-yielding passenger, our product is perfectly suited to them. This is the destination they are looking for, and it’s a world-wide audience. NEWS: What brings them here? MAYELL: It’s a combination of the natural landscapes, the cultural heritage and – the thing we’ve really undercooked, the complete story of the Territory. We’ve become too one-dimensional around indigenous culture. It’s an important element but until we get some consistent delivery of that product – and there are a few outstanding examples of it – there is an opportunity for drawing on the stories you and I know about: the School of the Air, the Royal Flying Doctor Service, the Overland Telegraph Line, the World War II heritage – building all that into one great story. NEWS: The flying doctor doesn’t fly any more, it’s a sophisticated flying ambulance, and School of the Air pupils on cattle stations are surfing the web no different to kids around the world. MAYELL: For someone who reckons we don’t sell the romance of the NT this observation is disappointing – holidays are about dreams and stories and learning the history of the place you are visiting you can’t discard the authenticity of those stories. They are still a representation of the story. These are great stories, which the Territory really can lay claim to. Having lived up here as a kid I’m proud of the things we did very well 20, 30 years ago, creating innovations not just for Australia but internationally. We’re forgetting them. The visitor now, especially the ones spending a lot of money, they are going somewhere to learn, things like remote and tropical health, horticulture, pastoral industry, solar. I look at these as tourism opportunities, magnets for visitation. It’s a matter of harnessing all those opportunities, all those assets, and building a story out of them, and making it a compelling place to visit. The beautiful scenery isn’t strong enough in its own right. 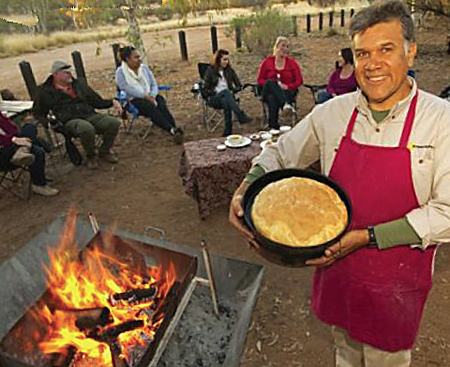 NEWS: What does the Ayers Rock Resort do for the people of Alice Springs? MAYELL: I think Uluru is probably the greatest asset of the Territory and I know that creates issues in some people’s minds. Look at King’s Canyon. 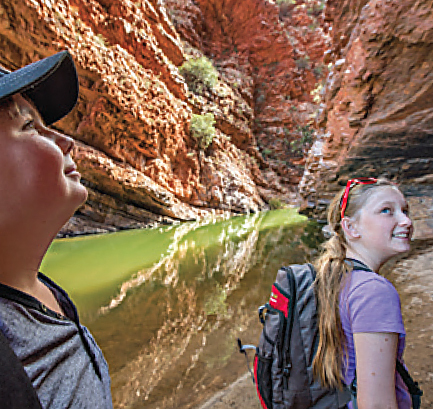 Since we’ve started to work closely with Voyages, building on the concept of the touring loops, not just flying to Uluru and flying out again, we say visit King’s Canyon on your way to Alice Springs. King’s Canyon had an incredible year. There is no way to get to King’s Canyon unless you go there from Alice Springs or Uluru. When you have a global icon like Uluru it’s a matter of milking that for all it’s worth, at the same time using it as a lever to disperse the traffic. NEWS: But we’re not doing that. Talking dollars, what does Alice Springs get out of Uluru and Kings Canyon? The Rock resort is owned by the Indigenous Land Corporation (ILC), a national organisation, and King’s Canyon is owned by an international company, which also repatriates its profits. MAYELL: Let’s have a bit of balance on this item. Lasseters is owned by Malaysian interests, the Doubletree by a private individual who lives in Sydney, our biggest touring company in the NT, AAT Kings, is owned by a multi national travel business headquartered between Switzerland, South Africa and the UK, the largest backpacker tour operation in the NT is owned by a UK and European conglomerate, the Ghan is now owned by a UK investment fund management company. Our largest coach charter outfit in Alice and possibly in the NT is owned by a WA based company, a number of our rental car companies are owned by multinationals. If you’re advocating that we should only be promoting NT owned products then the inventory gets pretty skinny pretty quickly, and to be honest, we are no different to most other destinations throughout Australia in respect of foreign ownership.That’s the way the world is these days. NEWS: These businesses do employ Alice Springs people and presumably support other local businesses. MAYELL: People are coming through King’s Canyon through to Alice Springs or the other way ’round. NEWS: What is that worth to Alice Springs in dollar terms? MAYELL: Visitor nights year ending September 2014 were Yulara 822,000, Alice Springs 1.67 million, proportionately has not changed much over the last eight years. 50% of visitors to Yulara also visit Alice Springs and their contribution is about $150 million each year. We treat Ayers Rock and Voyages as we treat any other partner. In terms of total promotion, the brand and everything else, obviously Uluru features pretty strongly. NEWS: The Ayers Rock Resort gets water, power and sewage utilities at standard rates although they are much more expensive to supply there. They get a school, clinic, police station at public expense. It seems the resort gets its supplies mostly from Adelaide and its staff is also mostly from interstate. They are not forthcoming with information about that. The Feds are running the national park which is the resort’s reason for being. Surely, the resort can pay for its own promotion. MAYELL: My view is that all businesses should be able to pay for their own promotion, it is not Government’s job to promote any individual business. This is not just true of tourism but any other sector. What an agency like Tourism NT can do is to create opportunity for businesses to promote their products through cooperative marketing activities which we may jointly fund. That is an opportunity available to all businesses except those who do not have resources to do so, in which case they should probably be doing something else for a living. NEWS: What is the Ayers Rock Resort spending in Alice Springs now? The resort is not giving us a straight answer to that question. MAYELL: ILC and Voyages should say to the people and businesses of Alice what its contribution to the local economy is. I think it would work to their advantage. I don’t know if their supply chains have changed. I can’t tell you. I don’t work for Ayers Rock Resort any more. NEWS: But shouldn’t you know? Wouldn’t their spending policies, supporting Alice Springs or not, be a significant consideration for TNT in regards to what it would do or not do for the resort? Out of the $40m plus a year of TNT budget, how much is used for the Ayers Rock Resort? MAYELL: I’d be surprised if it was any more than the MacDonnell Ranges, King’s Canyon. I saw the next round of creative [advertising material] this morning. I don’t think I saw a picture of The Rock in it. And certainly there is Kakadu and the Top End as well. Tourism Australia are using The Rock everywhere. The hero image of the Australian stand at the ITB [Internationale Tourismus-Börse, or International Tourism Exchange] in Berlin last year was Uluru. 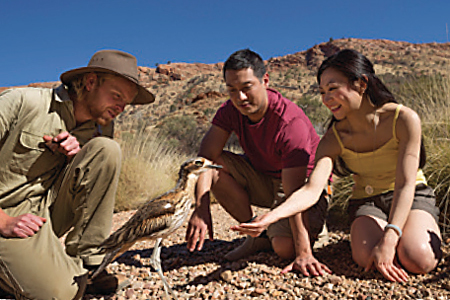 NEWS: Tourism Australia’s objective is to bring people to Australia. Your objective would be to support the Territory industry. 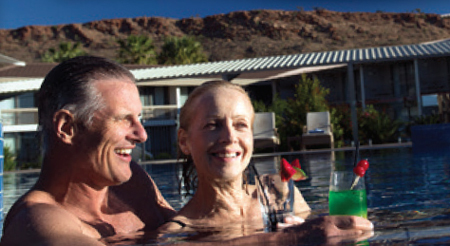 The Ayers Rock Resort is syphoning customers away from the Territory-owned industry. You seem to find it hard to define the benefits the people of Alice Springs are getting from promoting The Rock. MAYE LL (pictured): The content of the campaign is pretty well balanced and we’d be stupid to ignore the drawing power of The Rock, particularly on a global basis. NEWS: What’s the dollar income The Rock brings to Alice Springs? MAYELL: What does ILC contribute to the NT economy? MAYELL: You have to ask them that. NEWS: Would that not also be a key consideration for you about where you spend your budget? MAYELL: There are people who wouldn’t come to the Territory or Alice Springs at all if it were not for The Rock. My primary job is to encourage as many high yield visitors to come to the NT as possible however the industry must play a part if we are to be successful in converting the latent demand we know we are generating. I will use all the tools available to me including arguably Australia’s most significant global icon to do so and I do that unashamedly – it would be pure idiocy to do otherwise. The real challenge is then how we work with those delivering experiences in the Central Australian region to disperse that traffic that is drawn to Uluru – and that means identifying it as an opportunity and not a threat, as well as of course acknowledging what drives the consumer’s decision making. We can be as clever as we like about promotion of the destination. But if the product and experiences aren’t promoting their own businesses and looking at how they can bundle and piggy back their experiences off each other, including Uluru, to create that compelling proposition I referred to, which will convert that prospective customer, then we are wasting everyone’s time and money. NEWS: How many would not come to Alice Springs? The point is, whom should TNT’s $40m benefit? Surely not the ILC? MAYELL: Just told you we do not spend anymore on the resort than we do on the other regions and products throughout the NT, but its Territorians, absolutely. We have a feel for how many people do both destinations, but it does not give you a clear picture. And it concerns me that we get bogged down with this in Alice Springs. It’s for us to encourage visitors to include Alice Springs. The Territory, proportionate to population, spends vastly more on tourism promotion than any other state. The factor is something like 15 to one. Mr Mayell says there are two reasons: “Firstly the NT is more reliant on the tourism industry than any other jurisdiction except Tasmania, so instead of being critical of the Government’s commitment to the sector I would suggest that it should be congratulated. “Secondly, a smaller volume of advertising would get lost in the noise made by the bigger states, and operators put in much less cash for co-operative promotions: That figure in Queensland until recently has been 50% to 50%. In the Territory the TNT carries the burden 90% to 10% – conservatively,” says Mr Mayell. “If Tourism NT is not marketing the Territory, it would just not be on anyone’s radar whatsoever because the industry hasn’t got the resources to create enough noise. NEWS: This is something we have to live with? MAYELL: Yes. That’s the way we have adapted our strategy. I’d love to see more money coming to the table but that’s the reality. It’s the small operators who offer the fantastic experiences. NEWS: Should some of the money paid to TNT be diverted to asset creation, such as building or improving tourist roads? MAYELL: Apart from the public service we are the biggest employer in the Territory. Look at the $8m extra in the 2014/15 Budget. That would buy you a car park for a hotel. Lasseters Hotel spent $40m on their extensions. $8m will seal six kilometres of road. NEWS: The Boulia Shire Council says it can seal roads for under $300,000 a kilometre. MAYELL: I reckon we get screwed on roads in Australia but it’s not infrastructure that makes the difference. NEWS: The $24m for a totally unnecessary rail overpass south of town could have created 24 good, gravel 2WD access roads into beauty spots in the West and East Macs, enhancing our earning opportunities for decades. Is Tourism NT in the loop when governments talk about spending money? For example, Nigel Scullion is our man in Canberra. Our only one. He announced the overpass. Is that conversation taking place? MAYELL: I didn’t have that conversation with him and why would I? It happens at COAG, I believe. I think it’s the Department of Infrastructure in Canberra, nothing to do with him. I am not involved in these conversations. NEWS: Why not? Are you not the one to know where money is needed, by our only significant private employer? When conservative governments came to power both in Darwin and Canberra, people thought they would be talking to each other. MAYELL: They are talking about a national road, funded from Canberra. We are talking something totally different, NT Government responsibilities. The Chief [Minister] has indicated he’s prepared to look at expanding access to these sorts of places. It needs to be done. There is a bit of congestion in the old tried and true places. There are some real gems out there we should provide people access to … with good quality gravel roads. I’ve had some good conversations with Andrew Robb [Australian Minister for Trade and Investment] and members of his team. He’s got Austrade including tourism. He’s a highly influential member of Cabinet, and has been leading the charge for some time on the Northern Australia development agenda and he’s very aware of the Territory. Those conversations do happen. But take the truck parking bays on the Stuart Highway. They have not been well thought out, there has been no conversation. They are hardly ever used. My understanding is they cost half a million dollars each. It frustrates me there is not enough conversation about some of these things. Tourism should be at the table. After 34 years here and four in the remote area tourism area I think the planning authorities have missed the mark in focusing on the high yield end of the market, and are being slightly greedy. One manager put it to me this way: I would rather have one client paying $1000 a night than 100 clients paying $10. Less problems and easier money. They miss the point that 100 people coming here spend more money in associated businesses – food, entertainment, regional travel etc that one “high yielding” client. The total return to the operator might be the same but the distribution of the economic activity is far more widely spread. This is where we have gone wrong. On a recent trip South in May last year we encountered 374 vans heading North between here and Coober Pedy. I wondered at the time how many of them actually saw the visitors centre in town or for that matter, went on straight through without being intercepted at all by the town. Maybe they did not even know where it was. Signage at the same rock perhaps? Still conspicuous by its absence. There are at least 10 items of interest to visitors between there and the Gap, only one of which is exploited, but we have a brand new row of back yard fences were we should have a vibrant display of everything we do here, advertising ourselves and who we are. An unique environmentally sound village there would have been a hit, but no, we got a replica of anywhere else in Australia. Similarly at round the same time I did a brief survey of the traffic flow around the welcome rock south of town and there were 102 people photographed on that rock in the several hours that I sat there. It is so obvious that his is where the interception area for the “low yielding” visitors should have been and from there, directed to where we want the economic activity to be. I believe the total benefits to the NT would and should have been far more substantial and widely distributed than a few high yielding people arriving at the five star end of the market which seems to be the ultimate aim of the marketing plan. I have witnessed caravaners being fined for parking illegally while trying to access the Visitors centre. These things spread very rapidly amongst the caravaning community. In January last year the ABC programme “Summer all over” ran a survey of what the travelling public want in a visitors centre. The view was that the essentials were clean toilets and adequate parking. Ours has neither. The refusal of the planners in the industry to look at places such as McLaren Vale, in SA and in North Qld show just how far we are away from enticing travellers to stay here and investigate. There are new attractions all over the world that could be staged here but are ignored. Japan has a 100 km student marathon attracting 80 million TV viewers. Imagine that from Glen Helen to the Mall, but the planners show no interest in that free publicity when I explained it to them. The recent sand castle building on the beach South of Adelaide could be replicated here in the Todd. So the list goes on and will be so until the planners take off their blinkers and look around at where the real market is, and act accordingly. Well hello Byjingalo, quite the venomous response from you to my post. Thanks for that! In response I would merely like to re-iterate my post; it was my opinion only and I was merely recounting my sense of recoil when I last passed through, along with overheard opinions from interstate tourists. You may be correct in your assertion that I have failed to follow the unfolding story of Alice in the past 10 years. In short, I may have made assumptions – much like your assumption of what you seem to think life is like in Darwin. Trust me, living up here is more of a challenge than Alice and I consider Darwin vastly inferior to Alice in pretty much every way. Try living up here at certain climatically challenging times when you just want to die. Or perhaps you have? See, I just made another assumption. That little score-settling response aside, in your response to Hal Duell you mention that Alice has always been a point of arrival and departure to the other attractions of Central Australia. It seems that you think there is no financial detriment attached to this (there I go just assuming again), yet would it not be better for tourists to make Alice their anchor whilst they enjoy the surrounding attractions? The point of my post is that visitors are probably less likely to want to stay in a place that intimidates them. When I lived in Alice, the tourists you spoke to loved the place by and large. This was most assuredly not the tone of conversation I heard when staying there over Finke weekend a few years ago. Were it not for the race itself (most were there to either watch the race or were support for people in the race), most of the people I listened to would have taken flight days before. Again Byjingalo, just my opinion. Just because I live “above the Berrimah line” (I’d be willing to bet those words escaped your lips when you read my post), doesn’t mean that I can’t have an opinion about a town I truly love. It is an interesting article and in reading the comments below I to am saddened by the state of affairs in Alice these days. I lived in Alice for 18 years and my children were born and raised there. I to have a strong emotional tie to the town for its many wonderful traits, experiences it provided us and the friendships it gave. After leaving a few years ago we realised that in fact we did turn a blind eye to the anti-social aspect of the town (I note though this is not indifferent to many other locations throughout this great country). Everywhere has its positives and negatives – it is how we look at them and where we are in life’s journey to how we deal with them. For us, life’s journey took us away from a town that will be in our memory as a wonderful place and I truly hope that the anti-social issues that plague Alice can some how be managed in a way that will help get the town back to the mantle it had back in the late 80s early 90s, as a place where anyone who went to visit wanted to stay. @Tony Wood, Posted April 23, 2015 at 10:37 pm: This is as good a critique of Alice as she really is as I can remember reading. Tourists won’t go to places that scare / disgust them. And for long term residents who have no intention of leaving, among whom I count myself, just how much are we conditioned not to see, to step around, to accept as just-the-way-it-is? Completely unacceptable, if not revolting, behaviour? Ah well, that’s just the way it is. And maybe that really is just the way it is, but it makes for a hard sell in the tourist game. Ten years ago I left Alice for work, to the “big smoke” (which is true at certain times of the year) of Darwin. I have learnt with increasing sadness since my departure of the dwindling state of fortune of Alice Springs, a place that I love and yearn for still. I was quite sad at what I saw when I passed through years ago en-route to elsewhere (not unlike many these days it seems) – the businesses closed, the empty storefronts, the lack of energy. Where was the vibrant, incredible, beautiful town that I moved to a quarter of a century prior? The town that captivated me the very moment I entered it a quarter-century ago? The town that had given me so many great memories? It seemed bereft, bland, used-up and worn out. Why is this? Everything that everybody loves about it is still there – the impossible-to-rate MacDonnell Ranges that manage to look incredible no matter the time of year from east to west, the incredible stillness when you venture even a short distance from town (coupled with the aforementioned view), the amazing people (to this day the most laid-back and friendly place I have lived), the sheer improbability of such an amazing town being in the middle of absolutely nowhere. So why is it that people don’t view it as an attractive holiday destination anymore? When I lived in Alice it was well understood that most visitors were there just to have a look on the way to Uluru. If you got two days out of them you were doing well. It seems that they can’t be bothered with even that anymore. Can I offer my opinion of why people are more likely to bypass Alice as a port-of-call? This opinion is based on my own reaction when passing through as I mentioned earlier. I was simply astounded, amazed, mortified – whatever – by the number of itinerants shambling about the streets, loitering around any business that offered even a drop of alcohol. I have never seen such large groups of the lowest ebbs of humanity. I remarked on such to my wife, who had also lived for a time in Alice – “I have never seen them like this, this is astonishing”. 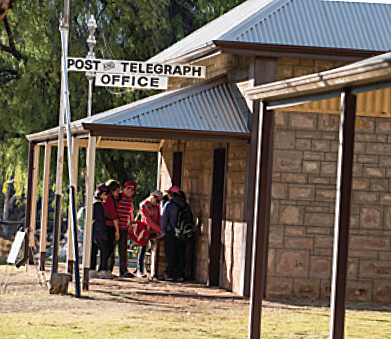 We were in town for Finke, and where we were staying was full of tourists. I overheard many expressions of horror from such tourists at the enormous numbers of people and their behavior, who and which they were clearly afraid of. Misguided fear as far as I am concerned, as they are largely harmless; more of a danger to themselves and each other than they are to the rest of us. Nonetheless, to those unfamiliar it must be an imposing and confronting sight. As any grey nomad will tell you, word-of-mouth is better than any advertising – they go where everybody else tells them is a good place to go. If Alice has a reputation for being a dangerous and scary place, it doesn’t matter how good the scenery is. That glass of wine with the amazing backdrop is made all the less attractive if people are publicly urinating, defecating, fornicating, fighting and trying to kill each other in the foreground. Good luck Alice, I love you and miss you still. I shall return one day, in the meantime – good luck.